"[A]nyone who works with Markov processes whose state space is uncountably infinite will need this most impressive book as a guide and reference." "There is no question but that space should immediately be reserved for [this] book on the library shelf. Those who aspire to mastery of the contents should also reserve a large number of long winter evenings." 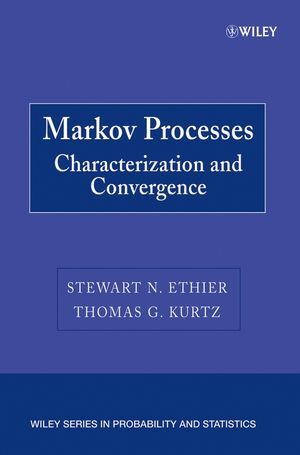 "Ethier and Kurtz have produced an excellent treatment of the modern theory of Markov processes that [is] useful both as a reference work and as a graduate textbook." Markov Processes presents several different approaches to proving weak approximation theorems for Markov processes, emphasizing the interplay of methods of characterization and approximation. Martingale problems for general Markov processes are systematically developed for the first time in book form. Useful to the professional as a reference and suitable for the graduate student as a text, this volume features a table of the interdependencies among the theorems, an extensive bibliography, and end-of-chapter problems. STEWART N. ETHIER, PhD, is Professor of Mathematics at the University of Utah. He received his PhD in mathematics at the University of WisconsinMadison. THOMAS G. KURTZ, PhD, is Professor of Mathematics and Statistics at the University of WisconsinMadison. He is a Book Review Editor for The Annals of Probability and the author of Approximation of Population Processes. Dr. Kurtz obtained his PhD in mathematics at Stanford University. 2. Stochastic Processes and Martingales. 3. Convergence of Probability Measures. 4. Generators and Markov Processes. 7. Invariance Principles and Diffusion Approximations. 11. Density Dependent Population Processes.